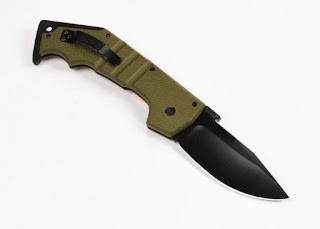 Best Chinese Knives: New Cold Steel AK-47 Triad Lock Clone Knife on AliExpress! New Cold Steel AK-47 Triad Lock Clone Knife on AliExpress! The new CS AK-47 clone have appeared on AliExpress. It features one of the toughest locks ever - a copy of the Triad Lock, a wave, OD green G10 handles and described "9Cr18" steel, although it might be a lesser one, but for less than $20, it's OK.
Users have already given a positive feedback about this model, so I hope more CS models will appear in the future.